Ohlalala! Mango Chutney. What should I say? You tell me. As far as I know, a favourite? Am I right or you want to out-rightly tell me I am wrong? Up to you really. I am not in the mood for arguing or changing your opinion, but I think I am right. I believe I am. I know, unless for whatever reason, generally mango chutney is selleable (Mango Coconut Jelly, Mango Mocktail, Mango Cheesecake, Mango Cucumber Salad, Mango Prawn Curry & Mango Coconut Cake). Obviously, we Indians tend to make more often than others? For our vegetarian meals or why not? 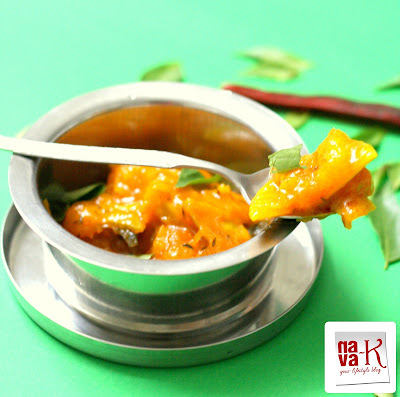 You can pair Mango Chutney alongside other many side dishes and mains (Beans Thoran, Bitter Gourd Sambar, Aloo Gobi, Tapioca Stir Fry & Lamb Kofta Curry). Alright. Let's make. Listed below are the ingredients for this tangy, spicy and much looked forward to Indian Mango Chutney. 2 medium size mangoes - sliced into medium size pieces with the skin on. The seeds can be added too. When oil is heated, sauté onion, ginger, cumin seeds and cinnamon. Add mango and the rest of the ingredients except curry leaves. Pour in 1/4 cup of water. Cook to soften mango, depending on how soft and mushy you prefer. If you like a mushy type, add more water. Lastly add curry leaves, stir and remove from heat. 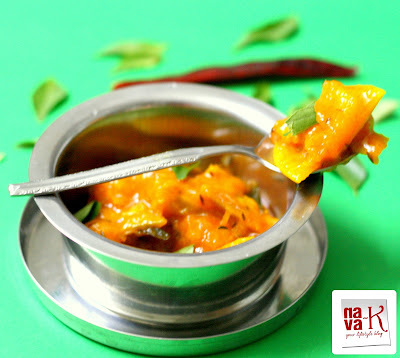 Chutneys are so appetizing especially mango ones! Shame on me - I've never made mango chutney! I was going to buy a jar tomorrow to mix with mayonnaise for a prawn starter I'm making. I will make some instead, thanks to you! I can't do without any chutney and Mango chutney is my favorite of all chutneys. That reminds that I haven't posted one. with tamarind juice and curry leaves its a completely different flavor for me. One of my favourites my friend great recipe! Delicious! You know I'm a mangophile. You find lots of restaurants here that serve mango chutney on eggs! Looks good! Will try it out soon! :) Thanks for sharing the recipe! This mango chutney looks so good!